This story revolves around a successful banker,popular writer,loving husband and father,Aditya Kapoor. According to author, the protagonist has it all. He is a perfect definition of a ‘great’,’well-settled’ human,until one day this definition starts deteriorating,when Aditya’s world collides with a young student,Shreya Kaushik’s world. It all begins when Aditya is invited to give a speech at his Alma mater,IIM Bengaluru,where he and Shreya have a heated confrontation (I won’t say an argument,because Aditya keep his calm during the whole conversation). After having this type of meet-up,Aditya seems more frustrating and angrier with the poor girl,but when she writes back to him admiring his work after reading his book in a single night,shows up in his talk-show in a local book-store,and keeps gushing about his work,makes Aditya slowly fall for her. He makes sure to get her hired from campus and assigned to him; all thanks to the HR for the bank who is his best friend- Sanjay. From there starts an extra marital affair of Aditya with Shreya,who comes out as an aspiring author. What he doesn’t know is the fact that the young lady here is planning to be an award-winning author by using Aditya’s name and him. Unaware of this,he helps in editing her work and sends it to the publisher,which further on picks up by the publisher for publishing. What seems right and perfect for his male-ego,Aditya finds it all wrong and a well-planned game of Shreya; with a single motive of getting herself published, known and to get him. And then Aditya has to set on a path of course correction. Ravi Subramanian,the author of this book- The Best-seller She Wrote is well known for his thriller-banking books. This is his first take on romance intrigue-to reach out to that large mass of people who prefer romance over thriller. Not like this book is any different from his other books,except the genre and the story-line of course. There are elements of his other books in this one as well- the job that Aditya does other than writing is of banking,and some characters are easily identifiable,while some are based on real ones. One of the themes the author has enlightened is the way manuscripts,these days,are selected by some publishers and how easily a new-bie can get known and become a best-seller author,when supported by another best-seller author. This maybe a possible reason for some pretty weird and crappy books that come out every year. I found the book unputdownable,because it is intriguing and makes us see through the eyes of a man,that what’s his view on extramarital affairs. Normally,such books are concentrated on a poor woman and her life after her lover’s betrayal. Usually woman getting distraught and how she ends up becoming a powerful personality. In this book,author presents another point of view. What happens when an aged man falls for a young girl,loses his well-nurtured family and after waking up from sleep,how he wants to correct everything,because all of sudden his love for his wife strikes again? When he comes to know about the betrayal yet remains in love with the woman? Is Aditya good or bad? Is shreya wrong or directed wrong? Is forgiving someone that easy? I also found the author’s way of narration interesting and simple. The words have been knitted together to form simple sentences,and thus forming a perfect story. The Bestseller She Wrote is fast paced and an easy read. It has like a whole lot of twist and turns waiting for you to get revealed,while the climax will definitely surprise you. 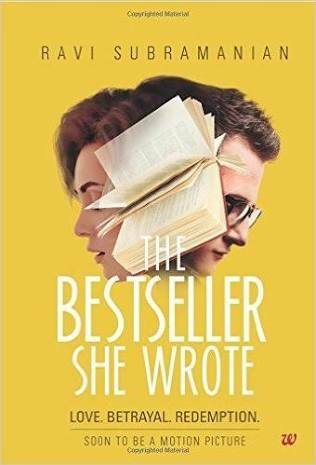 I am reviewing ‘The Bestseller She Wrote’ by Ravi Subramanian as a part of the biggestBook Review Program for Indian Bloggers. Participate now to get free books!